An impressive CTR of 2,96%, on a highest competitive market of retail online shopping, and average CPC 0,09 euro. Sante Shoes is a 30 years company in the business of women shoes. It is a Greek company focusing on innovative design and highest quality, and this is the reason for having such a strong brand name in the market. They required a digital marketing strategy, from the beginning of their e-shop, to increase visibility and online sales. Proving the value of digital to the board was also a priority, with a strong campaign that was heavily focused on website visitors, generating leads, and ROI. Commercial objectives included dramatic increase of website visitors, thus increase traffic and leads, as well as high ROI via Adwords campaign. Market competition was analyzed, while target audience was profiled, in order to set up the campaign. 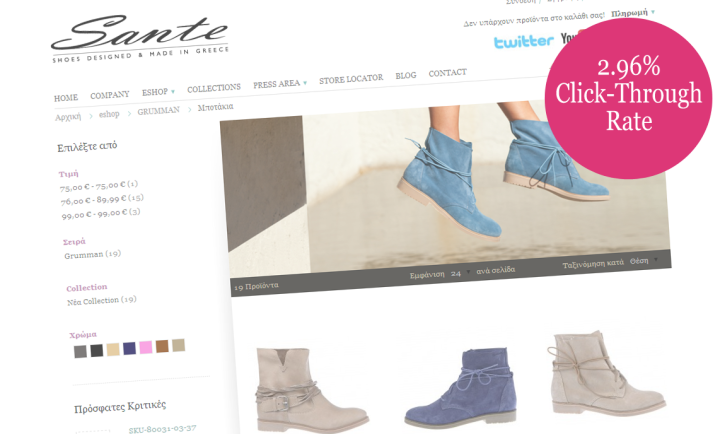 As AdOpt also had taken over the ecommerce development of Sante Shoes, it was a huge success factor for the further exploitation of marketing opportunity. The strategy of digital marketing campaign proved the concept of digital marketing to the Sante Shoes Board, which is now committed to accomplishing long term objectives online. Cooperation with AdOpt has always been solid and effectual. From the very first days, when they started the development of our Commercial Website until the recent AdWords Campaign, AdOpt makes you feel that they have your company's best interests in mind at all times. AdOpt’s staff is friendly and helpful with anything we have requested all these years.